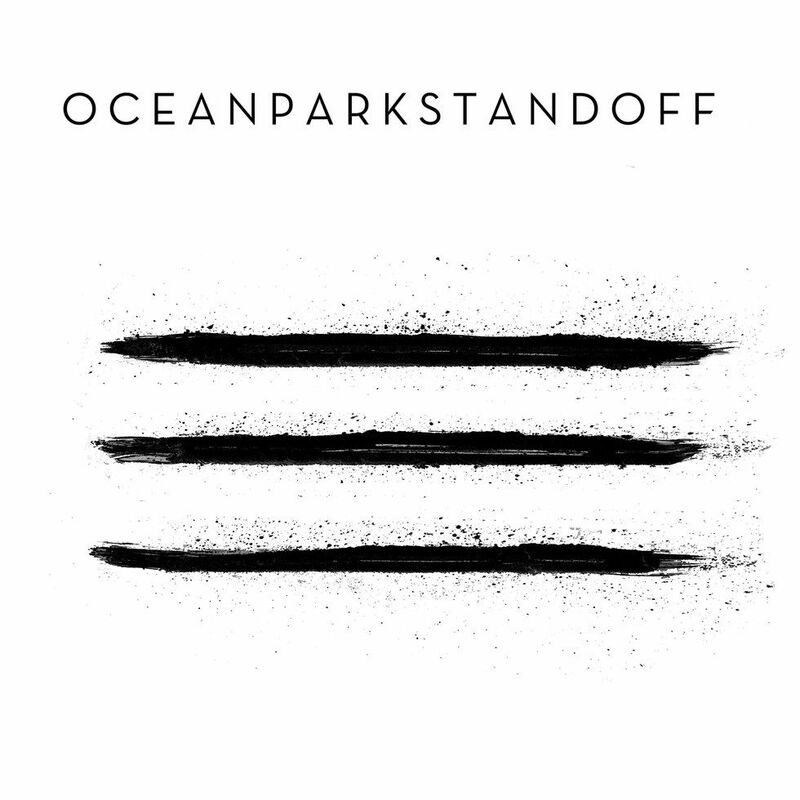 Samantha Ronson, Pete Nappi and Ethan Thompson, make up Ocean Park Standoff, the alt-pop band that released their first self-titled EP in March. Each member brings a unique set of skills to the band, from Ronson's DJing and songwriting experience to Nappi's masterful production skills to Thompson's background as a trained singer and songwriter. Their music is infectious and uplifting, as exhibited in their single "Good News," which makes a case for positivity and self-care. We caught up with the band to talk about their upcoming tour with Third Eye Blind and Silversun Pickups, songwriting, and making space for positive news. How did you pick your band name and the cover art for your latest EP? Thompson: We chose our band name because we were on our way to our session with Samantha the day after we decided we wanted to be a band, and all the streets were blocked off and there were cops. We didn't get to Samantha until an hour and a half later than we wanted to because we had to wait for them to let us through. And by the time we got there, there were helicopters flying over the back yard, and none of us really had any idea what was going on. Samantha, because she's from the area, knew where to look. We ended up looking online. Ronson: It was on one of the local news websites that there was a standoff between SWAT and a guy with a shotgun on the corner of Ocean Park and 10th street, so we were like, "Oh! Ocean Park Standoff!" And we had been going back and forth between a bunch of ideas for the cover art, and Ethan ended up picking it. Thompson: We all picked it together--we were determined to make it something we generated, so we thought the three [lines] represented us really well. We made it black and white to keep it simple, because we wanted people, for our first project, to interpret the music the way they wanted to. We didn't want to have a visual stimulation get in the way of that. I read in another interview that you prefer to release EPs because it allows you to express yourself in more genres. I recently spoke to a rapper who said that she books herself on bills with punk musicians or other indie artists because she thinks it's really important to have cross-genre shows. How do you think about defying genre? Thompson: Back when we were kids, we only had certain album collections, a certain amount of CDs we could get ahold of, so I feel like sounds were a lot more defined. Nowadays, we're influenced by so many things around us. We have Spotify, we're listening to hip-hop, punk, old blues songs, bluegrass, Americana. As a group, when you add the three of us together, we're inspired by all of [these genres]. We really think that the future is going to be jumping genres and seeing how you can put your artistry in a different genre, and seeing which one highlights you the best and also seeing how you can highlight yourself in different genres. Are you excited for your summer tour with Third Eye Blind and Silversun Pickups? Nappi: Excited is an understatement. We're ready to do it now. We've been talking about it for months. The day that we actually get to go and do it, we're going to cry ourselves to sleep. It's going to be great. Thompson: We're massive fans of both bands, so to get our first big tour with bands we know so well and the world knows so well is an incredible opportunity. We're stoked to be a part of that. And the fact that they're doing their 20-year [anniversary] of their self-titled EP and we're doing our first self-titled EP is really cool as well. You all bring a lot of diverse skills and experiences to the band. What is your songwriting and production process like? Ronson: We start songs together, but basically, Ethan and I write the songs, and then Pete handles 90% of the production the same way we handle 90% of the songwriting. But we do it all together because, seeing as it's a band, we all have to agree on what we will be playing. Obviously, Pete isn't going to want to be producing or playing a song he doesn't like. Thompson: Figuring out how to play live is always a very fun experience because Pete is so genius in the way that he produces sound that he manipulates it until it's not identifiable what [the sound] started out as. When we perform live, it's always a fun opportunity to reinterpret the song. Have you had to do a lot of that for this upcoming tour? Thompson: 100 percent. We really want to figure it out how to [make it flow] too, like one big DJ set. Ronson: Where there are no gaps or need for awkward conversation. Because once you've asked everyone how they're doing, there are a thousand answers. As a DJ, I never really get on the microphone either. My brother says, "Better to be thought a fool than to open your mouth and remove all doubt." The less room for error, the better. The song and video for "Good News" are super uplifting and relevant right now. What motivated you to write the song and to create the visuals? Ronson: We wrote the song over two years ago. It was about our daily lives and breakups and work issues and the fact that everything coming at us from the outside world was like, "It's only getting worse!" because that's what sells. Ethan said, "It's not the news, it's the bad news." And it was such a simple thing he said, but I had never really looked at it that way. Our manager suggested making a video of different clips, and we were like, "Yeah! Let's find all the best news that we can and highlight that for a change." People kept saying 2016 is the worst year of all time, but it wasn't even close to the worst year of all time, and there were also a lot of good things happening if you look. We wanted to make it easy for people to see those good things, and to give them light and hope. Splash photo by James Minchin.